A couple of weeks ago I wrote a post about the difficulty many people have grasping the logic of collective action problems — where the outcome of an interaction is bad, but where no individual has an incentive to stop doing the thing that is leading to that bad outcome (here). I’m reminded of this problem every morning these days, since vaccination has been in the news, first with the NHL players, and now with a measles outbreak in Toronto. The debate over vaccination is a perpetual source of frustration for me, because people insist on treating parents who refrain from vaccinating their children as irrational, whereas in most cases they are not being irrational, they are actually free riding, which is perfectly rational, in at least one sense of the term (i.e. the one used by economists). Thus they should be criticized for acting immorally, as opposed to irrationally. Unfortunately, because that’s difficult to explain, most of the people that I hear making the case for vaccination, especially doctors, present the case far too simplistically. They will claim, for instance, that vaccinations are perfectly safe. This is not true, some vaccinations do in fact carry with them a very small risk of (in some cases serious) side effects. Now the magnitude of that risk is very small, and is therefore easily outweighed by the dangers associated with catching the disease that it protects against. But this is where herd immunity comes in. If everyone else is vaccinating their kid, then your chances of getting the disease are minimal. So why run the risk of the side effects of the vaccination? Let other parents run that risk with their kids. Then you can get the benefits of herd immunity, and avoid the risk of side effects for your child. A classic free rider strategy. One can see here that when no one is getting vaccinated, there is an obvious benefit to getting vaccinated (and so the red line is well above the green one). (Hence the fact that, several decades ago, when childhood deaths from contagious diseases were an everyday occurrence — or when everyone knew someone in the older generation who had family member die of polio — vaccination was a no-brainer.) Getting vaccinated, however, generates a positive externality. Not only are you less likely to get sick, you are less likely to give the disease to others. Thus as the percentage of the population that is vaccinated increases, everyone enjoys the benefits, but those who are not vaccinated derive a much greater benefit (since they are far more vulnerable to the disease). Meanwhile, those who are vaccinated derive a very small benefit (since they are very unlikely to get the disease in the first place), but they are also running a small risk of side-effects. As a result, as more people get vaccinated, there reaches a point at which the benefits of not being vaccinated actually surpass the advantages of getting vaccinated. 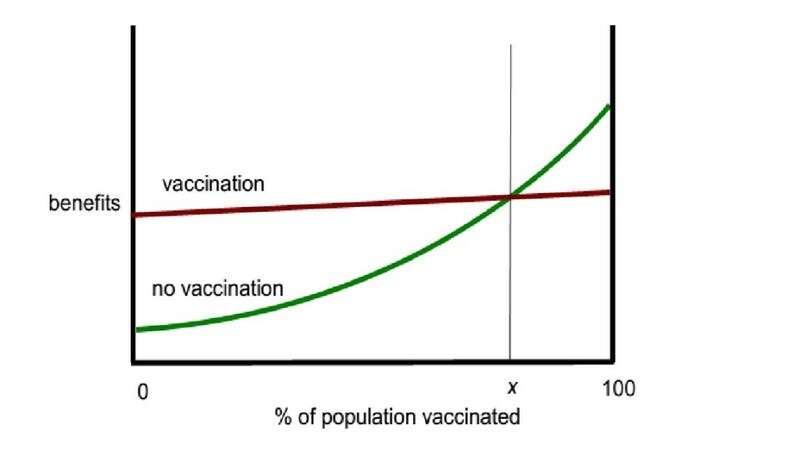 As a result, the equilibrium in the population is that x percent will get vaccinated (where x < 100% — resulting in a benefit level lower than the higher level obtainable at 100% vaccination). This all becomes important when it comes to developing a communications strategy for dealing with people who do not vaccinate their children. I’ve heard anti-vaccine parents saying that, before they vaccinate their child, they want assurances that the vaccine is “completely safe.” This is an assurance that they are never going to get. The MMR vaccine, for instance, does produce side effects in some children, some of which can be serious. So the answer is not to say — as I have heard some doctors say — that the vaccine is completely safe. Nor is it to say something that sounds complicated, like “well, there are some side effects, but these are very rare, etc.” (To which twitchy parents respond “RARE? HOW RARE?”) The answer is to say “you are morally obliged to vaccinate your child, regardless of the risk. We are all called upon to make a small sacrifice for the common good. Besides, how would you feel if someone else’s child died, because she caught a disease from your child, because you weren’t willing to run the small risk associated with getting him vaccinated?” In other words, the argument needs to be a moral one, not a prudential one. If only 30% of population was vaccinated (or 42%, as it turns out the rate is at a local Toronto “alternative” school), then the prudential argument works just fine. But once you’re past point x on my little graph (e.g. say 90% vaccination), then the prudential argument doesn’t work any more, and we need to shift to the moral one. Finally, just a little story. Anyone who looks up the records on my children will see that I made a “conscientious objection” claim for my daughter. I can explain. She got her MMR booster three days before her birthday. Years later we got an official letter from the government saying that our child had not received the required shots at age 6 (or whatever, I can’t remember exactly what age), and so we had a week or so to get it done or she would be kicked out of school. Called to complain and spoke to an almost comically inflexible bureaucrat, who absolutely would not accept that getting a shot at age 5 years + 362 days was, for all intents and purposes, equivalent to getting one at age 6. She was completely committed to making us go out and get it done again. So we chose the course of least resistance, which was to file for an conscientious exemption. I had this awesome plan to write a letter, explaining that we subscribe to an unusual religion called “science,” and that according to our belief system, receiving a vaccine on a Monday is just as effective, overall, as receiving it later in the week, say on Thursday. We consulted with religious officials — known as “doctors” — and they confirmed our interpretation of the holy texts, etc. Sadly, the form didn’t require any sort of explanation or justification, you just had to state that you had some reason for not wanting your kid vaccinated and they took your word for it. Great piece as always, but wouldn’t it be the right time to do something on Greece? What do you think about the “Modest Proposal” of Varoufakis/Holland/Galbraith and SYRIZA’s chances of selling it to the Hajnal-line-ese? any hope, or will we soon have to consider Jonathan Swift’s one? I suppose there could be an argument that anti-vaccination beliefs are facilitating natural selection, especially at the left side of the graph, although it seems unfair to put the kids at the mercy of parental choices. I believe you’ve hit the nail on the head. As somebody who is trained in biostatistics I’ve done a lot of reading in the primary literature of vaccines. The end result of which is I’ve gotten my children most but not all of the recommended shots although often on different schedules than recommended. And my main conclusion is that while there is a lot of misinformation from the anti-vaccine campaigners, there is actually a lot of misinformation from the vaccine advertising industry too. Among the misinformation: Its always in your best individual interest to get vaccinated (the point of your article). It is 100% safe (there’s whole databases of vaccine side effects). It is 100% effective (my son got meningitis that he was properly vaccinated against – he’s fine now – but no one in the hospital could believe it even though the studies show only about a 95% efficacy rate). The schedule for vaccinations are scientifically optimized (they’re actually predominantly based on convenience/minimization of number of visits). All vaccines are equally safe/important (the chicken pox vaccine was justified on economic grounds of preventing lost parent work days because its medical benefits weren’t strong enough which is a far cry from some of the earlier vaccines like diptheria or whooping cough let alone small pox and polio). Combining vaccines into one shot is perfectly safe and effective (I believe the reason my son got meningitis despite being vaccinated was that it was part of a five-in-one-shot vaccine with clear documentation that such combined shots are less effective than individual shots and most studies claiming safety for combining involve only a few hundred patients which far too small a sample size for rare side effects). When the anti-vaccine folks giving irrational arguments are met by medical officials touting irrational arguments, it leaves a lot of distrust and a propensity to make up your own mind. The medical establishment would be much better served to be the rational scientific voice in this debate even if it is more complex, but they’re failing. On the point that “the argument needs to be a moral one, not a prudential one”, though, I completely agree that it’s worth trying as a way of getting otherwise reluctant parents to agree to have their kids vaccinated. The traditional, mostly prudential, messaging has not worked. I agree with Alessandro. I don’t think medical professionals are making irrational arguments. Rather, they’re exaggerating the benefits. But even if the information circulated was 100% accurate, I don’t think anti-vaxxers would change their minds. The main issues are getting people to think in terms of probabilities (which the mind has a devilish problem with), and to internalize the costs of their actions, as Heath points out. And yeah, to sidestep these problems it probably is better to make the moral argument. Two further points about irrationality: First, my primary desire was to draw that Schelling-graph, because it’s the only way I know to make clear the idea that the rational strategy changes, depending on what’s going on with the rest of the population. So an action that in some circumstances might be irrational (not getting vaccinated when very few other people are vaccinated) can be rational in others (not getting vaccinated when many other people are vaccinated). CBC radio wanted me to come on an talk about vaccination and I said no, because I feel like you really need the picture to grasp the dynamics of it, and I couldn’t show the picture on the radio so I wrote a blog post instead. Also, one esoteric complication — I said that the optimal outcome is 100%, but actually it could easily be somewhat less. It might actually be the case that once 99.5% of the population is vaccinated, it would actually be better, from a population health perspective, not to have the final .5% of the population suffer the side effect risks of the vaccine! But that’s a totally academic point, it would only muddy the waters in public discussion. Second, when doing that Hobbes post that I linked to, I reread my very old paper about ideology and collective action problems, and noticed that my view has changed in one respect. I used to draw a sharp contrast between explanations that posit false belief and those that posit a collective action problems. I am now much more aware of the way that self-interest biases belief, and so I think things are complicated by the fact that free riders often rationalize their conduct by adopting false beliefs (or fail to think critically about them, because they have no interest in doing so). That’s the idea I’m groping towards with this idea of the false belief being “downstream” from the collective action problem. Anyhow, working all this out carefully would require a whole paper because there are lots of neat distinctions to be drawn in there. I’ll put that on the queue of philosophy papers that I plan to write — check back in 10 years! I was listening to the The Current on CBC on this subject and it was mentioned that rich, educated people are increasingly anti-vaccine, and there was a correlation with the placement of a Whole Foods that could predict these sentiments. I immediately thought of your writing on faulty counter cultural thinking, that this is surely an excellent example of its legacy. I can’t resist adding one other observation: one thing that drive me crazy about the anti-vaccine people that I’ve talked to is that they’re all the crunchy-granola types who like alternative medicine, because it works by “bolstering the immune system.” So if you get cancer, rather than doing “toxic” chemo, you should just eat herbal supplements to “bolster your immune system” — then they spend a bunch of money on stuff that has no such effect. The thing about vaccines is that, the way they work is by actually bolstering your immune system, which is what these people claim to want medicine to do. It’s crazy-making. In trying to understand these kinds of “debates”, we need to be alert to multiple meanings of the same words. When “the immune system” is referred to by that particular anti-vaccine faction, they don’t mean “the immune system” as studied by the thousands of scientists in departments of immunology and research institutes all over the world. Instead, the term is used to give an acceptably modern face to a constellation of folk beliefs that imagine some kind of benign, ethereal force field that responds directly to wishful thinking. But please don’t be quite so hard on granola. I had some yesterday at breakfast, and still managed to think coherently for the rest of the day. I saw an interesting idea on Real Time with Bill Maher tonight from the new Economist Editor in Chief that is related to your anecdote about your daughter’s exemption from the school’s vaccine program. She brought up a perfect opportunity for a nudge policy by just making the exemption process as difficult as possible while making the vaccine process as easy as possible. The paperwork that you had to go through was clearly not difficult to process even though you had prepared for a more complicated process. The exemption process should be so hard that only the most dedicated would actually be able to get through all the hoops. This whole vaccination controversy the last few weeks has been an eye opener. What has surprised me the most, I think, is how utterly unscientific those wandering around pompously claiming their allegiance to their god Science are showing themselves to be. Science of course first involves the scientific process – which involves many things, but begins with some kind of problem or question to be answered, for which theories are developed and tested. A notable fact of the scientific process is that when questions arise about anything it is doing, or results it has found, the scientists involved do **not** get in a big defensive huff and start name-calling those who ask the questions and declare the questioners ‘anti-science morons’ etc etc. The scientific process, the true scientist, is *always* open-minded, willing, even anxious, to have their results questioned so they can start working on more complete answers. And yet in this controversy, and other similar ones, we have a whole herd of apparent civilians running around doing exactly that, in the name of ‘science’. Nobody in this gang apparently has any idea whatsoever of the criticisms raised about this public policy, other than some Hollywood actress made a name for herself by accusing the vaccine of causing autism in some cases, and they now attempt to equate everyone questioning this public policy with this lady (which, again, is very unscientific, as there is a great deal more research out there that has nothing to do with this lady, and a great number of people questioning the policy for other grounds), and, as any bandwagon member does, thinking up clever new insults to call the heathes disbelievers without, I repeat, it seems, having the remotest clue as to what those who question are actually talking about. Research and insightful commentaries are mentioned, and the self-appointed heathen bashers don’t even try to follow the ‘science’ they profess to believe in, they just mock the research or commentary sight unseen as ‘unscientific’ and those referring to it as ‘flat earthers’, ‘morons’, ‘conspiracy theorists’, and etc etc. Which no true scientist engaged in a scientific inquiry would ever do, without even the courtesy of asking some intelligent person questioning the vaccine why they are having problems with the published science – of course, ad hominem straw dogs are much easier to shoot down than calm, serious arguments – but such a process is hardly ‘scientific’. >> the pro-vaccers try to say this (low measles death rate in modern Canada) is because of the vaccine (you clueless idiot!! ), but apparently measles deaths and serious complications had dropped to pretty close to zero at least a decade before the vaccine was introduced, and it seems to be a matter of history that the first vaccine had various problems when introduced in Canada – it seems a bit telling to me that the pro-vax side does not have readily available a chart of some kind from Public Health Canada or someone so anxious to prove why we all really need to get with this program, showing a timeline of measles cases and deaths going back to the beginning of the last century or so when measles was a much more serious matter in Canada, and a line on the chart showing the introduction of the measles vaccine, which very tellingly coincides with a sharp decline in measles deaths/serious sequelae very shortly following – given the heated nature of this controversy, it seems very odd to me that such a chart is not being widely used, as kind of an ultimate argument to prove the value of this vaccine pretty much beyond question and thus shut the anti-vaxxers up. But oddly no such chart has ever been produced, just the endless mindless insults from the pro-vaccers telling us what idiots etc we are for not unquestioningly doing as we are told, and how they are supporting science by insulting us and refusing to engage in reasonable discussion. And then we ‘asking questions’ types are frequently told there is a problem with stats because measles deaths were not recorded for a decade or so around the 60s – apparently not seeing the reverse side of this – why weren’t they being recorded, Canada certainly had the ability to do so? The most probable answer being – measles was not seen as a serious enough problem to spend resources tracking – and if the disease had indeed been practically controlled from a public health standpoint a decade *before* the vaccine was introduced, this would have the converse effect of taking the wind out of the sails of the pro-vaccers and their bogeyman stories. But talking to the pro-vaxxers is like playing whack-a-mole, when you back them into a corner of some kind, like this one, they just duck out of sight and come up somewhere else with some other ad hominem attack, or irrelevant (to Canada) factoid, like 140,000 people died around the world last year from measles!! – whaddya say to that huh?!? – and given this modern fact of life in a capitalist economy, some of us at least get suspicious when the governments and media (both at least heavily influenced if not actually controlled by Big Money), start telling us there is some kind of bogeyman loose on the land, and we must do something for our own safety!!! – I get very suspicious of whatever they are selling, and start looking around the edges of the story to see what they are NOT telling us, and usually there is quite a bit to find. The people who rule us are very much not in the business of enacting public policy for the good of the peasants. Enacting public policy so the wealthy can become wealthier – now that is something they excel at. This may be a cynical view of our country, but it is an undeniably true one. Sadly. And when people are running around assuming Science!! is a god of some kind whose findings are not to be questioned, we really need to understand that there is pretty ample evidence to contradict that assumption. Well, that’s about enough. I am very much a believer in science and the scientific method, and one of the things that means to me is thinking for myself, and asking questions when things do not seem right, and deciding for myself what validity the provided answers, if any, have. I am a believer in modern medicine also, which has figured out a lot of good ways to help us all over the years – but I do not see either medicine or science as gods – both are populated by human beings, and human beings are very much prone to error, and very much prone to various kinds of corruption. Science does not translate as ‘turn your brains off peasants and believe what your high priests and their self-declared messengers tell you!’ – that is religion, which science is not, and which I do not follow.